This year, the Undergraduate Finance Board (UFB) is launching a campaign to improve transparency. As part of this effort, UFB has launched a new website, www.brownufb.org, which showcases our funding policies and helps students better navigate the funding process. In addition to the website, we are publishing reports to communicate how the student activities fee is allocated. In this report, we will provide a big-picture overview of how the Student Activities Fee is allocated. Each year, every undergraduate student at Brown pays $286.00 into the Student Activities Fund as part of Brown tuition, which amounts to approximately $1.9M per year. In addition, any money that was allocated but not spent in the previous year and ticket revenues from Gala and the Brown Concert Agency are returned to UFB, which amounts to $300,000. The total amount expected to be allocated for 2018-2019 is approximately $2,200,000. The board determines in advance how the money will be allocated for the upcoming academic year between a number of different funding buckets. This report will dive into the details of how the fund is allocated between these funding buckets. Some numbers in this report are estimates since we are unsure how much will be allocated in this fiscal year. The majority of the money that UFB allocates is directly spent by student groups ~$1,604,526 or 73%. As of 2018, there are 200 active Category 3 groups who are able to request money from UFB. This funding can be broken into: Annual Budgeting for 2018-2019 ($1,112,526 or 51%), Supplemental Budgeting ($374,000 or 17%), Baseline Funding ($82,000 or 3.7%), and Appeals ($36,000 or 1.6%). Annual and Supplemental Budgeting for Category 3 student groups account for 68% of the total fund. Annual Budgeting takes place at the end of the spring semester and all funding for student groups that can be predicted in advance is allocated at this time. Annual budgeting accounts for $1,112,526 or 51% of the fund. Many student groups only request funding at this time. Supplemental Budgeting allocates money for events and expenses that could not be predicted far enough in advance during Annual Budgeting. This accounts for $374,000 or 17% of the fund. These include requests such as transportation, speakers with negotiated rates, and additional unforeseen costs. All funding that occurs outside of Annual Budgeting falls under Supplemental Budgeting. Baseline funding and appeals accounts for the rest of the money that goes directly to student groups ($118,000 or 5% of the fund). Baseline Funding ($82,000 or 3.7% of the fund) is $200 that both Category 2 and 3 groups receive each semester to spend at their own discretion. The purpose of baseline is to allow student groups to pay for items not traditionally covered by UFB - such as team bonding dinners, group T-shirts, and publicity beyond UFB’s $25 per event limit. Appeals ($36,000 or 1.6% of the fund) is money set aside for groups to appeal funding decisions made during Annual Budgeting. Student groups have three weeks to appeal decisions from Annual Budgeting before the spring semester ends. The remaining 27% of the fund can further be segmented into two general categories: Event Support and Other. Event Support includes Facilities (student groups can use facilities services without having to request money from UFB), Department of Public Safety, and the Fire Marshall. Together, these three services cost $336,600, or 15% of the fund. DPS and the Fire Marshall are required by the university to be present at large student events, so UFB pays for student groups’ utilization of their services. The money spent on these line items are dependent on how many events are hosted by student groups, so the amount listed above is a prediction for the coming year. Other is a category that accounts for the remaining $259,474, or 12% of the fund. A portion of this category is to support events hosted by the Brown Center for Students of Color (BCSC), the LGBTQ Center, and the Sarah Doyle Women's Center. The BCSC receives $68,200 a year to support the center’s Heritage Series. The LGBTQ Center receives $15,000 to support Pride Month, and the Sarah Doyle Women’s Center receives $15,000 for Women’s History Month programming. The programming done by these centers is run by students paid by the center who run and organize these campus events. The fund also supports Club Athletics, which receives $75,000. This money covers 11 club teams that originated as student groups and then were transferred to be managed by the Athletic Department. These teams include badminton, cycling, figure skating, six martial arts groups, polo, running club, and the yacht club. These groups continue to follow UFB policies even though the Athletic Department handles all operational expenses. Another expense is an on-campus student Attorney who receives $5,850 a year to provide free legal advice to students regarding issues such as landlord disputes and other concerns that arise. Finally, the student activities fee covers the server cost of BearSync, which is $22,500 and allows for the management of student activities. Any remaining funds act as a buffer to ensure that UFB doesn’t over-spend in case costs are higher than anticipated. 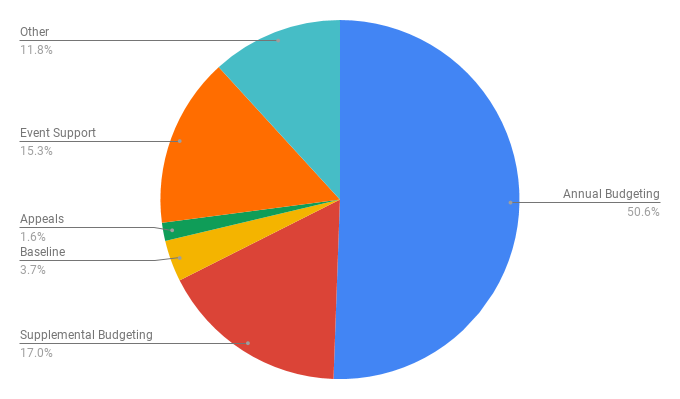 Below is a pie chart that breaks the $2,200,000 fund for 2018-2019 into its largest segments in order to illustrate the breakdown described above. September 14, 2018: Service Group Categorization (Cat S) Eliminated: Prior to the 2017/2018 school year, service groups were funded by a separate board called the "Service Group Funding Board." Each semester, UFB would allocated $5,000 to this board, which would then allocate the money to service groups that were categorized as Category S by the Undergraduate Council of Students (UCS). However, in the fall of 2017, UCS eliminated this board, putting all service groups under the responsibility of UFB. During the 2017/2018 school year, UFB attempted to maintain the Category S designation by establishing a new set of policies that would allow service groups to receive money for things specific to service groups that Category III groups were not granted (such as money to hold fundraisers). UFB also expanded the cap to $7,000 per semester during that year. However, we found that this system was unnecessarily complicated, frustrating for Category S groups, and challenging to enforce. As a result, UFB has eliminated the Category S designation. Effective September 14, 2018, Category S groups will be moved to either Category II or III groups, as determined by UCS. Welcome to the new independent UFB website! This will be the hub for all information about UFB from here on out. Before I go any further, I would like to thank Yuzuka Akasaka, the 2017-2018 UFB Chair, for being the first person to champion having a UFB website and for doing most of the initial research and work for the first version of the website, which was formerly part of brownucs.org. Without her, UFB would not be where it is now. Why do we need an independent website? There are three main reasons why UFB is launching an independent website: first, to increase understanding of our policies, second, to give UFB a means to communicate with students on campus, and third, to increase transparency surrounding the student activity fee allocation. First and foremost, all of our policies will be posted on the website. In the past, there has been a great deal of confusion surrounding our policies. We hope this website can be used as a useful resource to clarify any questions before groups meet with their representative. Before submitting a budget, we encourage all groups to double check to make sure that what they are requesting fits into these policies. This will save a great deal of time and ensure a smoother process. Second, this website will give UFB the ability to communicate directly with the student body. From now on, UFB will announce new initiatives, explain policy changes, and respond directly to comments or questions by issuing statements on this website. These statements and the website are meant to be a source of accurate information for students. Third, this website will increase transparency surrounding the allocation of the Student Activities Fund. Every undergraduate student at Brown pays into this fund, so we see it as UFB's responsibility to be open about how the money is allocated to groups. Starting in the 2018-2019 academic year, UFB is working to issue reports outlining how the fund is used. We do all of this in the hopes of providing clarity and transparency around UFB. As a student elected board, we are responsible for catering to the needs of the student body and work to be receptive to feedback. We hope this website becomes a useful tool, and we look forward to continuing to improve the site and our budgeting process to accomplish that goal.